Lukas Foss and Jason Presson wear black high top and optical white low cut Converse “Chuck Taylor” All Stars in the film. Frankie Scarlatti is haunted by the ghost of a murdered girl and the real presence of her murderer. Lady in White is an entertaining ghost story that exists at several levels of meaning. At first, there is a tribute to horror writers (especially Stephen King) as we see successful author Frank Scarlatti return to his small town boyhood home of Willowpoint Falls, New York on a fine autumn day. On the way to the town from the airport, he instructs the cab driver to stop for a moment at the local cemetery. As they get out the cabby remarks, “You don’t actually believe all that stuff you write about do you?” which sets off a flashback to the year 1962 when Frank was 10 years old, a gentler more innocent time, but nevertheless a time of turmoil in much of the country over the emerging civil rights movement, which is alluded to in several places during the story. We then discover the other elements of the story — a murder mystery intertwined with a ghost story. It is Halloween and we see an excited Frankie (Lukas Haas) eagerly getting ready for school in his costume and with a toothy pumpkin all carved to bring along. Frankie’s Italian-American family is deftly introduced in this scene: his older brother Geno (Jason Presson) who likes to pull pranks on the unsuspecting Frankie, his common sense and supportive father (Alex Rocco), a recent widower, and his immigrant grandparents Mama Assunta (Renata Vanni) who has taken over mothering the children, and Papa Charlie (Angelo Bertolini), who mainly acts as a comic foil in the story, continually getting caught or embarrassing himself while trying to sneak away and smoke forbidden cigarettes. Nothing will get in the way of Frankie enjoying this day, as he must perform bike heroics while chasing after his brother on the way to school, gets sprayed on with a garden hose, is pursued by a pack of dogs, or falls into wet cement after Geno scares him and he loses his balance. In the school classroom, we soon find out why. Frankie has written a special horror story for the day called “The Beast That Destroyed London” and we see a glimpse of his future abilities. The reading scares the class, even his teacher, not so much for the story, but for the kicker ending that makes you think for a minute. But the attention Frankie receives for reading his story irritates two other boys in the class who decide to play a trick on the naive Frankie. They hide his new cap in the cloakroom, and when they see him outside after school persuade him to go back there to get it, and then lock him in the room. Frankie takes a look at the haunted house of the Lady in White. As time passes, the room gets darker and the moon rises, Frankie realizes that he probably won’t be rescued until morning, and nods off. Then suddenly a strange happening begins. He sees the ghost of a young girl about his age, hears her singing “Did you ever see a dream walking?”, listens to her talking to him, and then watches her experience a series of death throes. It seems that she was murdered in this room ten years ago. The ghost disappears when another visitor appears. This person is real however, and when he spies Frankie in the corner, begins to choke him. 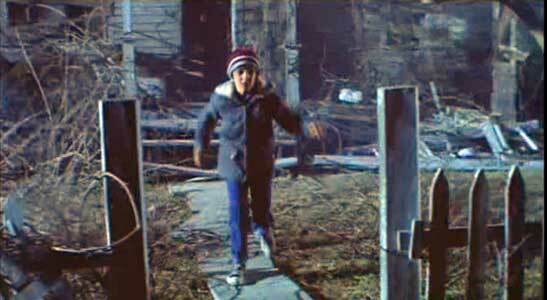 As Frankie passes out, he goes through a dream sequence with scenes of his mother’s funeral which quickly turn into a nightmare of the dead young girl being carried off by an unseen person, and then visions of his friends visiting his own grave site. But fortunately Frankie wasn’t murdered, and is found still alive in the cloakroom due to the quick thinking of his father. After the boy is revived, the police decide to arrest the school’s black janitor, who was drunk and had fallen asleep on the job. With nothing but circumstantial evidence and no real motive, they nevertheless charge him with the assault on Frankie, and the unsolved murders of several children, including the first victim, who we discover was named Melissa. But some of the townspeople, including Frankie’s father, believe that the janitor is just a convenient scapegoat, and an uneasy feeling settles over Willowpoint Falls. But this experience is a cathartic moment in Frankie’s life, and he is determined to find justice for the girl and for her reclusive mother Amanda (Katherine Helmond), known around town as the “Lady in White”. During the ghostly apparition, there is the sound of something falling into the cloakroom floor heating duct, and later Frankie retrieves a ring that might provide a clue to the murderer’s identity. 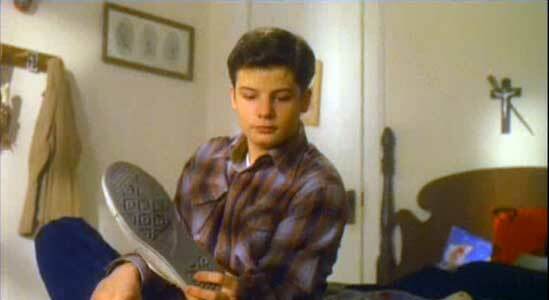 The remainder of the film focuses on this search, as Frankie enlists Geno to help him discover the true identity of the serial killer. 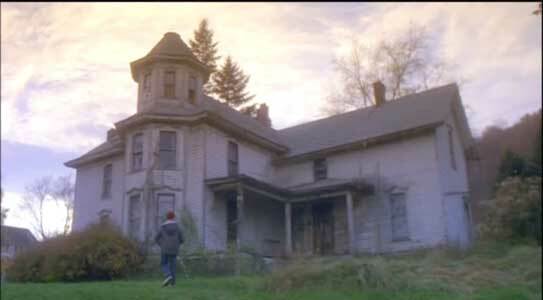 The storyline alternates between ghostly appearances by Melissa, warm family moments as the Scarlatti family tries to deal with the turmoil that has suddenly come into their lives and literal cliffhanger adventure when the true identity of the killer is revealed and he chases after Frankie to silence him. Geno discovers important evidence on the bedroom floor while taking off his chucks. Lady in White succeeds as a film because it is able to tell its complicated story without losing track of its small town human details. You get the feeling that the characters in this story could really exist, so their encounters with ghostly apparitions and special effects seem more believable. The story isn’t so much about being frightened by ghosts as it is about feeling sorry for the suffering they have endured that makes them still roam the earth looking for spiritual fulfillment. 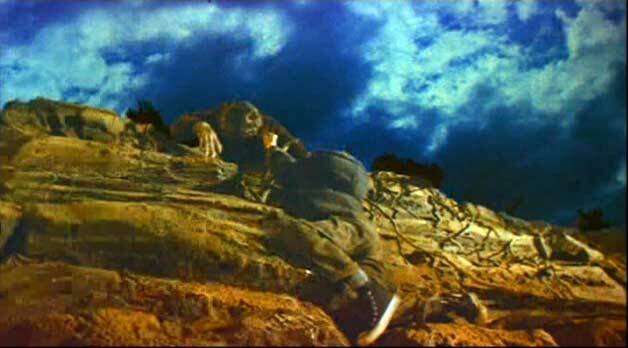 In fact, the special effects aren’t particularly necessary for the story to be a success. At the end of the film, there is so much melodrama, fantasy, and struggling for survival that you tend to forget the subtle elements of mystery that got you there in the first place. Regardless of any plot flaws, director and writer Frank LaLoggia has put together a fine ensemble cast that carries the moment and you sense that there is a lot of autobiography in the screenplay. 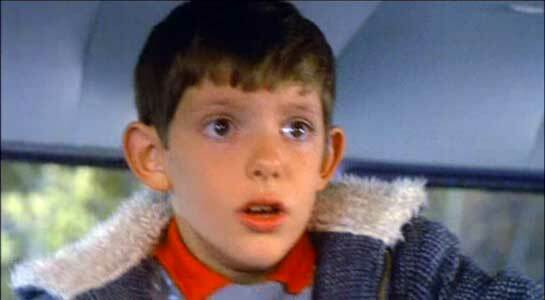 Lukas Haas puts in a great performance as the shy yet determined young Frankie. You sense his fragility and fear at times, yet there is a courageous side to his character that shines through when needed. Alex Rocco, Jason Presson, Renata Vanni, and Len Cariou give down to earth performances respectively in their roles as Frankie’s father, brother, grandmother, and adopted uncle. You end up liking this family, and empathize with them when they face adversity. In fact you become so enamored of the gentle style set by the earlier part of the film, that you wonder if some of the ghostly special effects or violence at the end was really needed. (But what Hollywood thriller doesn’t have the obligatory “villain coming back for a second death struggle” scene) Nevertheless, the well defined characters and dramatic sense used by LaLoggia for Lady in White will entertain you. Frankie enters the haunted house on a dare from his friends. Frankie struggles to get away from the murderer. It’s 1962 in a small town in America, and the film is about kids growing up. 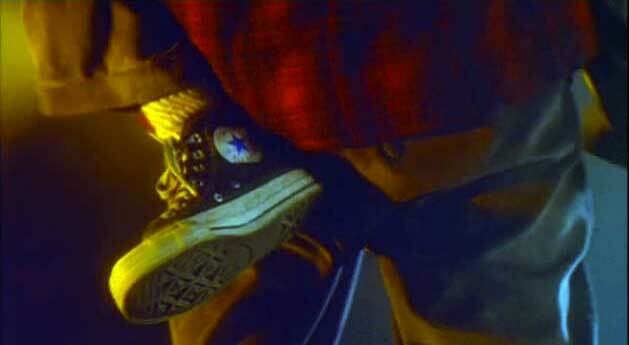 So of course there are scenes where we see Chuck Taylors, but in this film they are mostly concentrated at the end of the film. A couple of Frankie’s classmates are briefly seen wearing white hightops, and Geno has a pair of white low cuts that he wears at home. 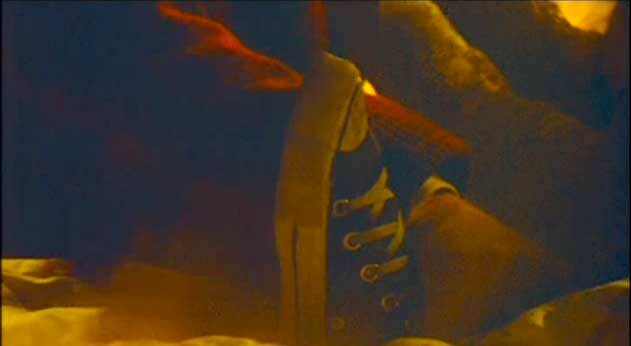 Frankie wears a pair of black high tops in all of the later action and chase scenes. 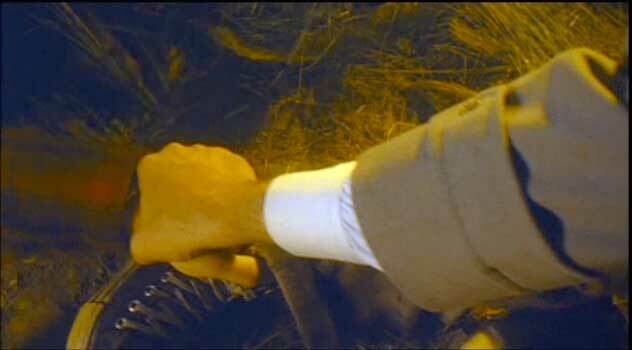 The camera work continually focuses on them as we see Frankie struggling to escape from the killer. 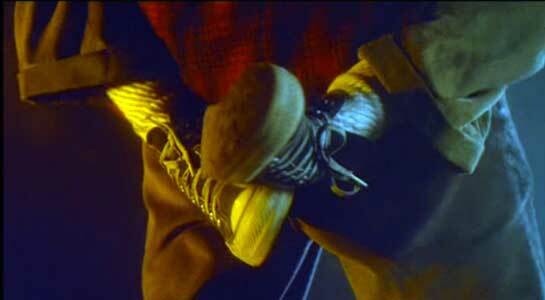 They seem to be used as a symbol of Frankie’s youthful innocence as he battles against a serial child murderer. Five of these shots are shown below. Click on the thumbnails to see the jpegs. 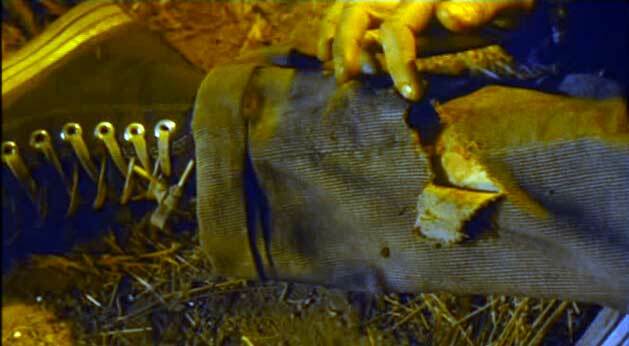 From left to right: The murderers hand grabs Frankie’s leg in the burning house. Frankie kicks and struggles to get away from the killer. Frankie hangs on the edge of a cliff. Frankie’s injured leg hobbles his ability to escape. Frankie’s dad lends a hand to help him get free. Lady in White. (1988) Lukas Haas, Len Cariou, Alex Rocco, Jason Presson, Katherine Helmond. Directed by Frank LaLoggia. Categories: Drama, Fantasy, Crime and Mystery.